As we all begin our New Years Resolutions I PrOmIsE you WilL NoT find me walking around with a shiny new gym membership. Ooooooooh no!!! You all know I couldn’t even follow through with The Lazy Girls Workout! Looking back on that post, maybe I was pushing myself with saying I was going to start out aiming to workout 3 to 4 times a week. If I had started with 1 to 2 and gradually added on maybe I would have stuck with it! 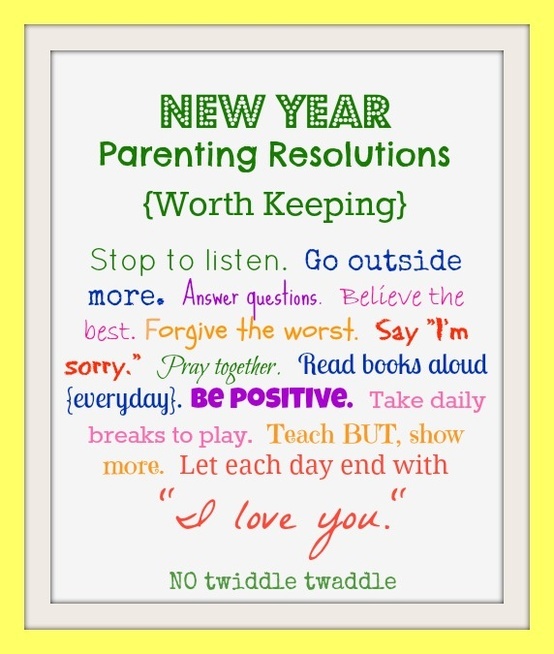 Anyway…I’ll worry about toning in the spring and stick with these ReAlisTiC ReSoLuTiOnS that will benefit my entire family! I found this while looking for cute winter crafts on Pinterest and realized these are all things that I need to do not only for my family, but for MySeLf! I spend way too much time trying to get everything done and need to focus more on the important things in life. They may seem simple, but they so often get overlooked and could be the difference in making your child’s day go from OK to OuTanDiNg!